What does fall dormancy of alfalfa really mean? Many do not understand what fall dormancy really is and its value to alfalfa growers. Fall dormancy is the ability of alfalfa to grow tall in the fall. It is measured by determining plant height about 25 days after a fall cutting is taken following a spring planting. The taller alfalfa grows in the fall, the less dormant it is. Dormancy scores range from 1 to 11, with 1 being the most dormant and 11 being the least dormant. To survive the winter, alfalfa undergoes an acclimation period in the late summer that is induced by a combination of falling temperatures and shorter days. It’s intuitive to think that those alfalfa plants that spend the fall storing carbohydrates and proteins in the taproot and changing their structure and physiology are the ones most able to survive cold temperatures. This is certainly true over the entire range of fall dormancy, where fall dormancies of 1 and 2 are very winterhardy and fall dormancies of 10 and 11 have no ability to survive cold weather. At the same time, less fall dormancy results in more fall growth, faster spring recovery and higher yield in the next year. For this reason, most alfalfa growers like to plant the least fall-dormant type that will survive their winters in their region. The good news is that over the last 30 years plant breeders have broken the relationship between fall dormancy and winter survival for northern alfalfa varieties. 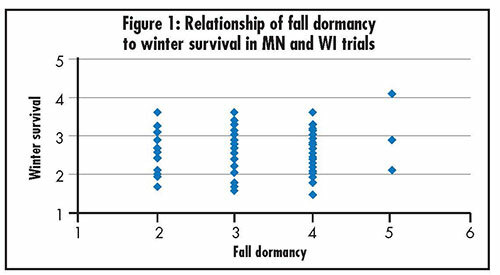 As shown in Figure 1, trials at the Universities of Minnesota and Wisconsin show little relationship between fall dormancy and winter survival over the range of 2 to 5 fall dormancy varieties. Breaking of the relationship between fall dormancy and winter survival means that, while much of the Northern states used to grow a fall dormancy 2 to have adequate winter survival, they can now grow a 4 or 5 fall dormancy variety. The advantage of growing less fall dormant varieties is higher yield. This is documented in Figure 2. While the relationship is not direct because some varieties have less disease and insect resistance than others, clearly varieties with less fall dormancy (higher scores) tended to have higher yield. They tend to start growing earlier in the spring. They tend to green up faster following cutting during the season. They tend to grow taller in the fall. However, each of the three benefits of less fall-dormant types can have negative impacts in particular farming situations. While earlier spring green up will increase yield, if green up is too early, a late frost can kill the top growth and force the plant to start over making new buds and shoots. This can actually delay green up and reduce yield below more fall dormant types that did not have enough growth to be impacted by the frost. Furthermore, less fall dormant types will green up faster if a short period of warm weather occurs over winter. For example, a fall dormancy 2 variety generally takes four to five days with temperatures above 60°F to start growing, while a fall dormancy 5 will start growing in as little as two days with temperatures above 60°F. Once plants have started to grow they lose some of their winterhardiness and spend stored carbohydrates; false starts over winter can hurt winter survival and yield the next year if plants green up prematurely. Snow cover can delay the regrowth when short warm periods occur. Faster green up following cutting is advantageous if the farmer can take advantage of it. The benefit of faster green up occurs if the farmer can cut and remove the forage before regrowth occurs. If regrowth is driven over and stems are broken, the advantage of faster regrowth for the next cutting’s yield is lost. This is why fields harvested for haylage (within 24 hours of cutting) tend to yield more than fields harvested for hay. Taking advantage of the faster regrowth means that farmers must manage hay drying to get it off the field in three or four days rather than longer time periods. I usually recommend fall dormancy 5 in northern regions only for fields harvested entirely for haylage, and 4.5 or less fall dormancy for fields harvested for hay on any or all cuttings. If it takes longer than three days to get hay off the field, much of the advantage of quick alfalfa recovery after cutting is lost. The increased fall height can be beneficial and justify a late-fall cutting. With the older, fall dormancy 2 varieties, fall rarely accumulates enough to warrant an additional harvest. 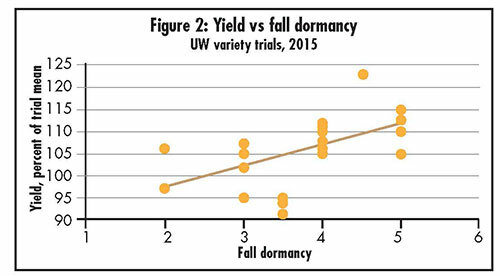 Fall dormancy 4 or higher varieties will sometimes produce sufficient growth to make a late-fall harvest feasible; it can add 15 to 18 percent to total season yield. It can also be beneficial to fill silos one last time before winter. However, the additional fall growth, if unharvested, can insulate the crown against cold temperature and can catch and hold snow more than a clipped field. Both of these factors can enhance winter survival and yield for the next year. If winters are mild and/or snow cover is good, the residue is not necessary for good winter survival or yield next year. Breaking of the relationship of fall dormancy and winter survival presents many opportunities to farmers for higher yield. However, appropriate management must be in place to take advantage of the genetics for higher yield without hurting stand survival. This article appeared in the February 2016 issue of Hay & Forage Grower on page 14 and 15.